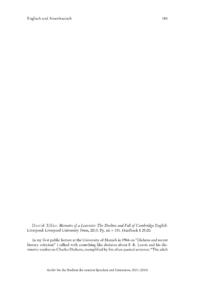 David Ellis: Memoirs of a Leavisite: The Decline and Fall of Cambridge English. In my first public lecture at the University of Munich in 1966 on Dickens and recent literary criticism I talked with something like derision about F. R. Leavis and his dismissive verdict on Charles Dickens, exemplified by his often quoted sentence: The adult mind doesnt as a rule find in Dickens a challenge to an unusual and sustained seriousness. (cf. The Great Tradition, p. 29) Immediately afterwards, a colleague from Cambridge (not Downing) who happened to be present drew my attention to the fact that Leavis had in the meantime revised his views on Dickens, which seemed to make my superficial remarks obsolete. Five years later, while spending six months as a visiting scholar in Cambridge, I was introduced to a colleague who bitterly complained about the stifling Leavisite atmosphere pervading English studies there; he left the same year for a continental university.